Excellent! So my previous theory about this feature missing in the XKM 3000 Z module firmware version 1.02 was wrong – it was missing for certain device types in the gateway firmware (2.0.3). I don’t have the equipment to test if the bulbs live up to the specifications, but at least one of the specifications is incorrect: It’s not an MR11 bulb. Well, sort of. Almost. I’ve never had any problem with halogen bulbs of any brand, but these bulbs are too large to fit into my spots. Bummer! A 1 mm difference would probably have made it possible to fit the retaining ring clips into the spot. So that’s how I found out – I didn’t get five identical bulbs, even though it was the same order. So they downgraded the CRI, but upgraded the efficiency a tiny bit. These bulbs are ugly, but at least they fit into standard MR11 spots. 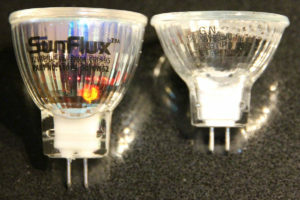 I’m not sure why they made a new version of the old bulb with almost identical specifications as the new one (except the lower CRI). We’ll see if part number 11015 is being phased out.